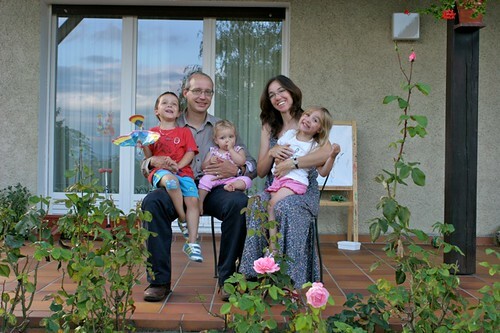 Jen is a British mother who is raising her children to speak German, French and English. She blogs about her experiences with raising trilingual children on her blog Trilingual Trio. Tell us a little bit about yourself and your family. Are you monolingual? Multilingual? In which way are you raising bilingual children? We are a family of two originally monolingual parents, speaking respectively English (in my case) and German (in my husband, Thomas’ case), now raising three trilingual children. The oldest is a 5 year old boy, then there is a girl aged 3 (nearly 4) and a baby girl who just turned 1. We practice OPOL (one person, one language): the children and I speak English together, while Papa and the children speak German together. The third language comes in because we live in a French-speaking area (just to complicate things for us even further, we live on the border between France and Switzerland). So the community language is French and the children’s daycare is entirely French-speaking. Thomas and I both speak English and German fluently, so at home we tend to interchange the two. I also speak pretty good French, and Thomas can speak the French he needs to manage everyday life and conversations in a francophone environment. This is such a long answer to a short question! Why is it important to you that you raise your children to be bilingual? Why is bilingualism important to you? Being multilingual is not so much important to us for some abstract intellectual reasons, it’s simply part of the fabric of our everyday life. Thomas and I ended up living in this area for his work, so even without the children we lived multilingually simply because we spoke our languages at home (and often at work too) and there was another language outside the door. When the children were born, we didn’t have to think about it for very long, it just seemed obvious to us that they should speak our heritage languages, so that they could communicate with their relations and have the option of “returning” to where we had come from if that ever became possible or desirable. How could we ever have decided between English and German, and exclude one set of (monolingual) grandparents from talking to our children? Also, there was just no question of us speaking French with them, as our French (and in particular Thomas’) was not up to it. He wouldn’t have understood most of what I was saying to them and I’d have had to translate into English or German anyway. We also decided that the children should learn the best French they could so that they wouldn’t face the difficulties we sometimes have only speaking the local language imperfectly. Having said all that, we were also aware that however good our plans and intentions, things might work out differently in reality. So we have always been ready to either change the set-up or even give up on a language should that in the end be the best thing for us and the children. What have been your greatest successes or celebrations in raising bilingual children? I am quite proud that right now I have three balanced trilingual children (OK, so the baby isn’t talking just yet, but I know she differentiates between languages because she looks surprised if I happen to forget and speak or sing to her in French, and she shows the same amount of understanding – as far as you can tell at that age – in all three languages). The children’s English has always been strong, I suspect because I have worked part-time since they were born, so they always heard lots of English. I have never had any indication that their French was less good that of other children of their own age, probably because they have all been in part-time French-speaking daycare since they were four months old. I find it a little difficult to judge their level in French though, because we very rarely hear it at home. Now, their German used to be weaker than their French and English, and our great success has been in bringing it up to strength. I said at the beginning that they speak German with their father, but that hasn’t always been the case. They used to use a lot of English with him, because I used to speak English with him sometimes too, so we showed them that was okay. Also, they heard less German because he was working full-time whereas I was part-time. So we thought about how we could increase their exposure to German and basically make it easier for them to use German with Thomas. When the last baby was born, we decided to get a German-speaking au pair to: a) help with looking after three small children and b) try and boost their German. It has worked a treat – to the extent that I think that maybe the next au pair should be an English speaker, because I have the feeling that the children’s German is getting a little more fluent than their English! What challenges have you faced as a parent who is raising bilingual children? I think our biggest challenge is that maintaining their balanced trilingualism (and extending it from oral skills to literacy skills in three languages) is going to be a never-ending task. You’re always on the job, keeping an eye out for changes in this language, wondering whether a boost in one is the sign of a deficit in another (not necessarily!). For example, I’ve been noticing recently that we seem to have fewer and fewer books in English. Most of the ones we have acquired recently are in German or French, so I need to do something about that. And as we get into more school-based language skills this is going to become even more important. But it is the same with my own language skills, which vary with life circumstances. I used to work, read and write a lot in German, but I’ve been using more English recently, so now I’m wondering what I should do to counter that for myself too. What tips or suggestions do you have for other parents who are raising bilingual children or would like to raise bilingual children in the future? If you’re living in a multilingual environment, it is rarely static. Life circumstances do vary and with them possibilities for using and learning (and forgetting!) languages. I think if you bear that in mind and try to provide your children with the potential to exploit whatever languages are going to be useful to them at different stages in their lives, then you’re doing a good job as a multilingual parent. So for example, had our children not started using German with their Papa, I would still have continued their exposure to German so when they did have to communicate with monolingual German-speakers, they would have had the capacity to develop the active skills very fast. I recently read about a similar situation where it took as little as a two-week stay with relatives to enable a little girl to activate her knowledge of her minority language, because it was useful to her there – and she then continued to use the minority language in the appropriate places even when she returned to her majority language environment. In our international situation (we tend to hang out with other international colleagues and friends rather than socialise with locals) it’s pretty much the norm to be multilingual. For a children’s birthday party last month I wanted to write some forfeits for a pass-the-parcel game and I had to go through my list of the 10 or so children invited to work out what language to use – turned out to be French, because they all go to French-language pre-school or creche – and all of them spoke two or three languages. So while we still have some of the issues about getting hold of resources and how to create the exposure to our home languages which would normally come from the outside environment, we are in the privileged position of not having to convince our children that it’s okay and useful to speak another language. I think we benefit a lot from this – I wish it were something you could transfer to all bilingual families! Bio: Jen is a British mother of three children under five who is married to a German and lives in a French-speaking area. Jen has lived in the UK, Germany and France, working at various times in research, communications and adult education, including for the United Nations. You can also find her writing on her blog Trilingual Trio. Parent to Parent is a weekly interview series that features parents who are raising bilingual children. If you would like to participate in the interview series and share your experiences with other parents, please contact us at multilingualmania(at)yahoo(dot)com. What a fantastic gift that Jen and Thomas are giving their multilingual, multicultural children! Your readers might also like to check out the family profiles that I have posted on my blog at http://babybilingual.blogspot.com/search/label/profiles. I totally agree that with globalization “Being Multilingual is Part of the Fabric of Our Everyday Life”. In California, U.S where I live there are many immigrant families and I see a lot of bilingual and trilingual kids. They are doing very well.